Sound is measured in terms of frequency. The loudness is measured in decibels based on pressure levels of the sound. When we evaluate how well something (a speaker, microphone, ear, etc.) responds to a range of frequencies, we chart the results in the form of a frequency response graph. Below is an example of a frequency response graph. The graph shows how an earbud speaker responds to different sound frequencies. In this case, the word "respond" refers to the speaker's ability to reproduce audio frequencies. Reading the chart is actually pretty simple. The chart shows the range of frequencies (from low to high) horizontally and the Sound Pressure Levels (SPL) in Decibels (dB) vertically. 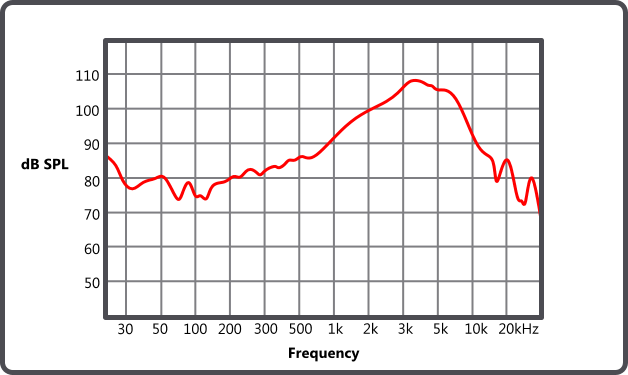 The frequency range respresented on this graph is 20Hz to 20,000Hz (20kHz), which is the range of typical human hearing. By looking at this frequency response graph, we can see how capable the speaker is at reproducing the frequencies we can hear. Generally, the range of bass frequencies encompasses 20Hz-500Hz. Midrange frequencies would be 500Hz to 5,000Hz, and high frequencies would be 5,000Hz-20kHz. However, the range is often further divided into sub categories such as "midbass" and "upper midrange". Familiarity with these ranges enables us to determine how a speaker should sound based on the Frequency Response Graph. Looking at the example above, we can see that the upper-midrange (where much acoustic detail is found) should be loud and clear. The bass frequencies appear to be lower (respectively). However, a full understanding of sound frequency response charts requires knowledge of many other variables involved with the application. The human ear hearing capability, interaction with other speakers, speaker enclosures, room acoustics, and many other factors must be considered when reading a frequency response graph. For instance, although the graph above shows a peak in the upper-midrange, since we know that the graph is for an earbud speaker, we can expect that in real-world listening the bass frequencies will actually be enhanced by the earbuds' contact with the inner ear. Had the chart shown a peak in the lower-midrange or bass frequencies, we may be wary that the earbuds will produce too much or "muddy" bass tones.